Last week, I was doing a project for AccuWeather Enterprise Solutions and I totaled the number of U.S. weather radars to which we have real time access: 185! That is about 50 more radars than some of our competitors advertise. 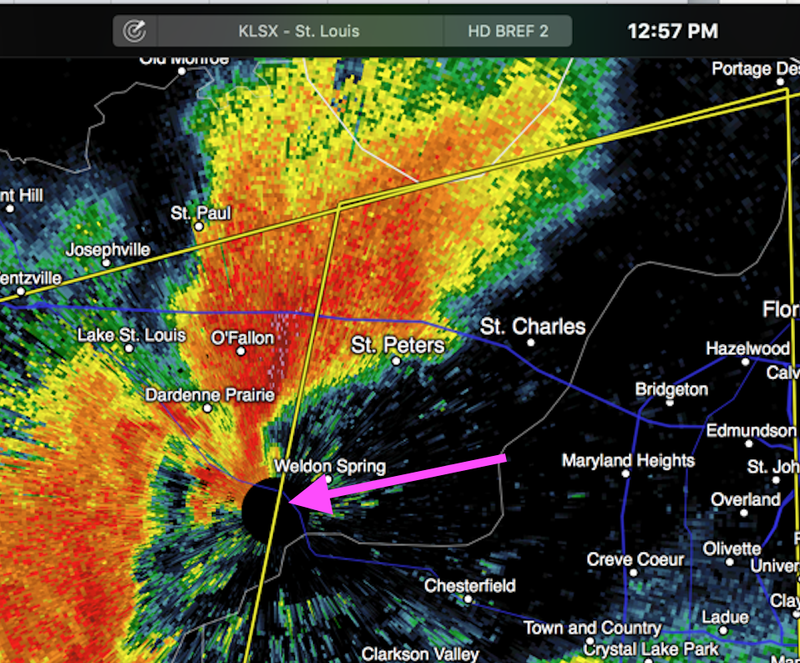 That mattered in St. Louis a few minutes ago. A severe thunderstorm warning was in effect and the STL Bi-State area was in the area where the NWS SPC was forecasting a significant threshold for tornadoes. 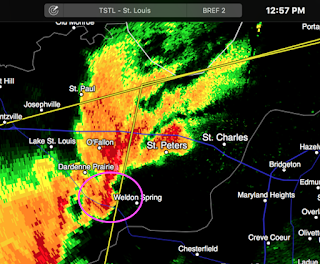 Because I used to live in St. Louis and still have friends there, I occasionally watch the radar for that area. One of the thunderstorms started to look like it had the potential to produce a tornado as it exhibited the first signs of a "hook echo" (circled). What I was watching was one of the Federal Aviation Administration's Terminal Doppler Radars. Why wasn't I watching the National Weather Service's radar? 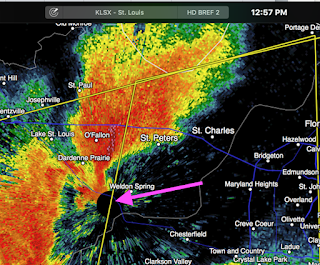 Because the radar is located in Weldon Spring and the potential tornado happened to be in the area known as the "cone of silence," the circular area blacked out immediately near the radar (arrow). Fortunately, the storm never "got its act together" and any potential tornado threat quickly passed. In this case, if a tornado had developed, it would immediately have been in a densely populated area. Our clients would have needed the extra notice we could have given them rather than waiting until the storm moved out of the cone of silence. I'm very proud to work for AccuWeather Enterprise Solutions where we continually innovate and push the science and technology forward in order to provide the most timely and accurate weather risk mitigation services to our enterprise clients.